Note. Our book supplements are patterned after our Research Packets. That is they come as unbound photocopies. Details. Remember: Also sell Volume Three. 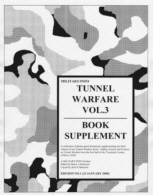 And have seven other volumes and suppplements in our Tunnel Warfare series.